9 Responses to …Just Waving! You know? 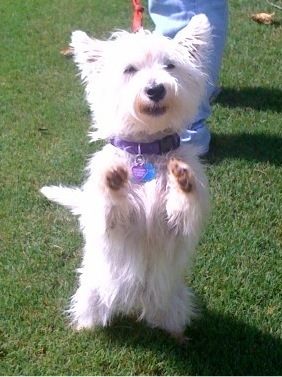 I too have a darling little Westie. I am disabled and need some help for her. Her knees are going bad. If you Know of anyone who could help please send them to this web site. How’s your westie doing? I so hope you’ve been able to secure funding for her treatment. WestieWaves! She’s patiently waiting. We have only collected $240 so far, not doing so good on that. Please could you resend the link? Aren’t they the best? Wuufs, Snowy. Glad we are sniffing each others. Hopes I can get my secretary off his butts to help me some mores with my barking. Whoas! I want a smores. Thanks for coming by! You’ll be seeing that Pink KritterKondo featured with a new resident soon! What a neat idea. All us Funny Farmers are waving back at ya. Have a great week! WestieWave! !